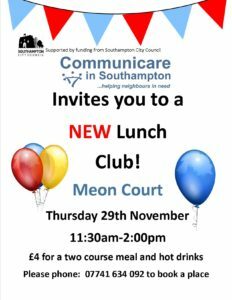 Come along to our New Lunch club at Meon Court, this will be our first TESTER lunch! Thursday 29th November, 11.30am-2.00pm. £4.00 for a 2-course meal and hot drinks. The group will then run on the last Thursday of each month from the New Year. Hope to see you there!